Ever wanted to have a customized icon appear every time you plug in your flash drive or External USB storage device? Today we’ll cover the easiest way to do this! OK, so in order for this to work you’ll need a flash drive or a USB External hard drive. Start off by picking an icon. The icon needs to be an .ico file with a maximum resolution of 256×256 pixels (Vista and 7). Tip – if you have a .png file and want to make an icon out of it you can use websites like ConvertIcon and ConvertIco (yes, it’s just 1 letter different but, the two websites are quite different). After you’ve got your icon ready we’ll need to create an .inf file that will give out the command to use the icon as your USB drive’s thumbnail. 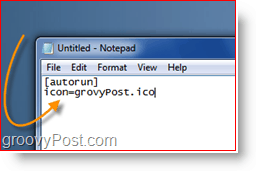 Write this command down and replace “groovyPost” with the filename of your icon. Warning – there must be no spaces in your filename in order for this to work. Select the type of file to be “All Files”. 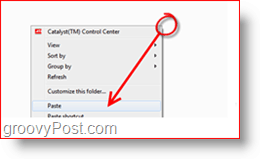 This allows us to enter a custom extension in the filename box. Remember where you saved your file! Next up is to copy both files to your USB Storage Device. 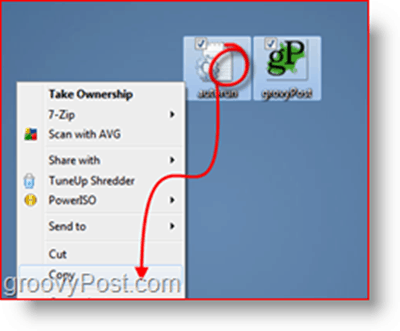 Note – both files need to be placed directly on the ROOT of the flash drive. Don’t put the files into any folders/sub-folders.onto the flash drive (not in any folders or briefcases) so that the autorun file does it’s job. In my case I’ve got an icon named groovyPost, so the second line of the command is “icon=groovyPost.ico”. Now let’s copy the files to the flash drive. 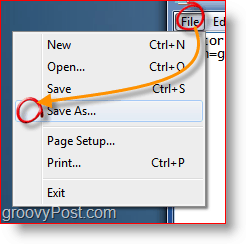 Make sure both files are selected and then right click on one of them, picking “Copy” from the context menu. Unplug your flash drive and plug it in again. Your custom icon should show up. It’s a fun groovy little trick that is BOUND to impress all your non-groovyReader Friends! I personally found the trick after I formatted my Western Digital External Studio Drive and lost the custom icon. Fortunately the trick is pretty simple and I was back up and running in no time! Hi, could you send me a personal reply to this if possible? I did this a while ago on an external HD that is 4 bays with 3TB in each of the 4 drives. I have each one for movies, photos, mp3s and etc. The issue I’m having is if I turn the drive off at night (to save energy and heat reasons) some days I wake up and the drives still have their new icons when I go to My Computer but the short cuts to those drives on my desk top lose their custom icons. Is there a way around that?